Updates are a fun surprise for anyone who tours our model homes, so periodically we redesign a few areas to keep things fresh and interesting. 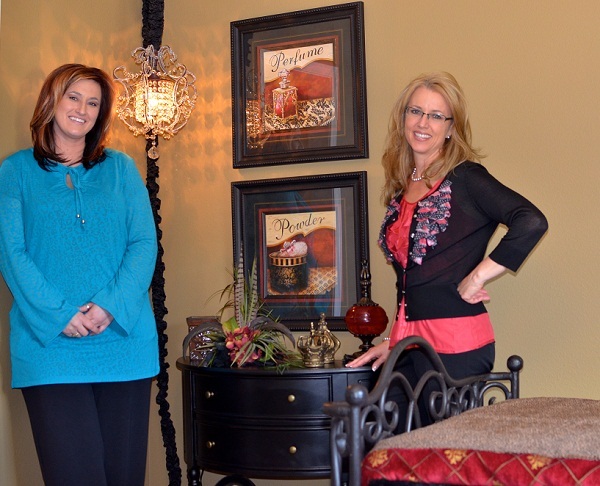 Michalea Calmes, who is a new home specialist at the Lubbock New Home Center, and I recently redesigned one of the Jack-and-Jill bedrooms in the Kari model home. 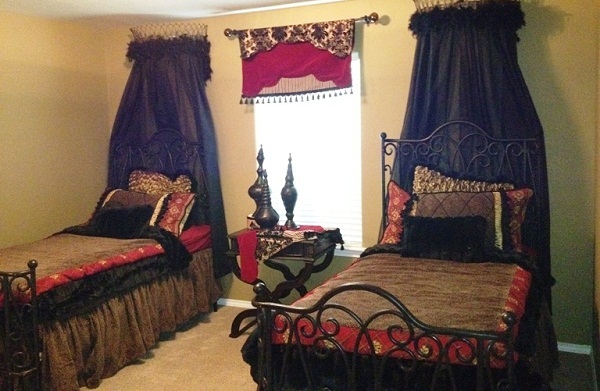 The room, planned for a little girl, went from pale green, chocolate brown, pink castles, and a canopy bed to bold red, black, gold, leopard print, chandeliers and two wrought-iron twin beds. While redesigning the room, we ran into a few problems. Unfortunately, twin comforters were not available in the print we selected from Hemispheres, so we purchased throws instead and they look beautiful! Also, the only available dust ruffle was a full/queen, so we actually draped the full/queen dust ruffle over the twin mattress and box spring, instead of placing it in between the mattress and box spring. We then placed the twin fitted sheet over the dust ruffle, and it was a perfect fit! It’s great to be open to different adaptations when decorating a space. One really helpful thing we learned was how easy it is to incorporate a chandelier with a lighting kit. Michalea knew about a kit from Lowe’s that adapts the chandelier to plug in to a wall outlet rather than being hardwired into the ceiling. Please stop by and visit the redesigned room! A golden brown tone, Jute. Coyote Candle Company, a local home furnishings store in southwest Lubbock. Their address is 14012 FM 1730, but since they are sort of off the beaten path, they would be happy to give directions – (806) 798-9677.